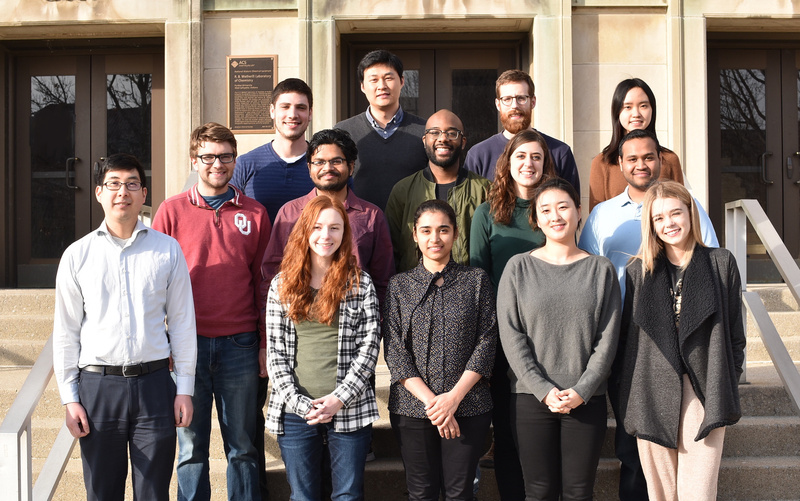 Research in our group spans the organic and inorganic subdisciplines of chemistry with an emphasis on catalytic approaches to unsolved problems in organic synthesis and renewable energy conversion. You-Yun publishes his work on dinickel-catalyzed [4+1] cycloaddition in Science. Kristen, Houng and Vibha join the group. Welcome! Conner, Nish and You-Yun publish their work on nickel-catalyzed cyclopentanation of enones in JACS. Jake publishes his work on Co-catalyzed dimethylcyclopropanation of 1,3-dienes in Angewandte Chemie. Arnab's beautiful spiderweb appears on the cover of Organometallics. Colby, Ian and Sudipta successfully defend their dissertations! Sudipta is selected to give a talk at the 2018 Organometallics GRS. Arnab publishes his investigation of carbene formation and transfer on the dinickel NDI platform in Organometallics. Sudipta wins the H.C. Brown Graduate Student Research Award, and presents her research at the 2018 H.C. Brown Lectures in Organic Chemistry. Talia, Doug and Heather successfully defend their dissertations. Congratulations! Ian reports a new dinickel-catalyzed azoarene synthesis from aryl azides in JACS. Colby gives her graduate research seminar. Heather publishes her investigation of a dinickel-catalyzed strained-ring–opening reaction in Organometallics. Heather gives her graduate research seminar. Sudipta gives her graduate research seminar. Talia wins the H. C. Brown Graduate Student Seminar Award. Jake's paper on the Co-catalyzed regioselective cyclopropanation of polyenes appears in Chemical Science. New graduate students Annah, Seulah and Sourish join the lab! Mike wins a poster award at the 2017 PINDU inorganic symposium. Doug reports a catalytic dinuclear C-C bond activation of norbornadiene in JACS. Talia gives her graduate research seminar. Dr. Uyeda presents our work on catalysis at metal-metal bonds at the 254th ACS National Meeting. Sudipta and You-Yun publish their vinylidene transfer methodology in JACS. We are grateful to the NIH MIRA program for funding our research. Check out the entry for our flagship dinickel complex in e-EROS! Colby and Jake publish their paper on dehydrogenative imine transformations in JOC. Ian's paper on C-H activation by a bridging dinickel nitrene is published in Chem Eur J.
Talia is awarded a Bisland Dissertation Fellowship, as well as the Charles Cameron Professional Development Award. Ian wins a poster award at the 34th Annual H. C. Brown Lectures in Organic Chemistry. Colby receives the Teaching Academy Teaching Award, as well as a poster award at the Brown Lectures. Conner wins the prestigious Arthur Kelley Teaching Award. Congratulations! Ian gives a poster presentation at the Inorganic Reaction Mechanisms GRC. Dr. Uyeda gives a lecture at the Organometallics GRC. Mike's paper on dinuclear oxidative addition is published in Dalton Transactions. Ian's perspective article on metal-metal bonds in catalysis is published in ACS Catalysis. Ian presents his work on dinickel bridging imidos at PINDU, a regional inorganic chemistry symposium. New graduate students John and Shawn join the group. Welcome! Dr. Uyeda is selected to give a presentation at the organometallics GRC. Talia gives a poster presentation at the organometallics GRC. Talia, Sudipta, Ian, Doug and Dr. Uyeda speak at the 47th Regional ACS Meeting. Doug's paper on the mechanism of the Pauson-Khand reaction is published in Angewandte Chemie. You-yun wins a poster award at the 2016 Herbert C. Brown Lectures. As a part of the Purdue GSSPC, Heather assists in the organization of a symposium for the 251st ACS National Meeting in San Diego. Dr. Uyeda is awarded a Sloan Fellowship. You-yun publishes a new catalytic reductive cyclopropanation in Angewandte Chemie. Our work on dinuclear Ni catalysis is reviewed in a Synpacts account. We are grateful to the NSF CAREER program for supporting our research. Talia presents a seminar on her hydrosilylation work at PINDU, a regional inorganic chemistry conference. The lab moves into our new space in Wetherill 450! Sudipta wins a poster award at the 2015 Negishi-Brown Lectures. Sudipta's paper, "Evaluating the Effect of Catalyst Nuclearity in Ni-Catalyzed Alkyne Cyclotrimerizations," appears in JACS. Talia's paper, "Reversible Substrate Activation and Catalysis at an Intact Metal-Metal Bond Using a Redox-Active Supporting Ligand," appears in JACS. Congratulations to Ian on being awarded an NSF graduate research fellowship! Mike and Jake join our group! We are grateful to the ACS Petroleum Research Fund for supporting our research on light-driven dehydrogenation reactions. Our group's first paper, "Dinuclear Nickel Complexes in Five States of Oxidation Using a Redox-Active Ligand," is published in Inorganic Chemistry.